"I'm a writer living in the Perth Hills with my relentlessly fun seeking children. This film didn't immediately ring bells that it would be a huge hit with my kids. A two hour movie about a 10 year old chess genius, growing up in the slums of Uganda. It sounded more like a trial by fire than a family feel good experience. However, I am happy to report that 'The Queen of Katwe' was everything I thought it wouldn't be. It is a triumph of a movie with an uplifting story guaranteed to leave you heartened by the human spirit. This is a Disney movie packed with feel good fuzzies without the sickly sweet after taste. This time they have ditched the princess in favour of a quiet and curious pawn Phiona (Madina Nalwanga) who rises up from the gutter to become queen of her game and her life. The true story of her rise to Ugandan chess champion is often raw, sometimes tear jerking, but always inspirational. Director Mina Nair paints a full and vivid picture of Phiona and her struggling family, trying to survive against all odds. David Oyelowo is perfectly cast as the determined coach, who never falters in his belief in her ability to rise above her situation. Whilst the movie makes no attempts to gloss over the squalor of living on the poverty line, it also resonates with rich characters, laughter and vibrant music, which goes some way to capture the spirit of Africa. This is a movie I would recommend for the over 10's. There are some subtle sexual references and a suggestion of prostitution, but it is not too overt. The language is mild and much of it flies straight over the kids' heads, but there are some harrowing scenes. There's one where a child is swept away by a flood, later to be recovered and another where a boy receives stitches after a motorbike accident. It might make you wince a little, but these scenes only serve to bring home the reality of the hardship of living in a third world country. 'The Queen of Katwe' is a wonderful family movie that engages its audience throughout, with its beautiful message to play the game of life with your whole heart, against all the odds. 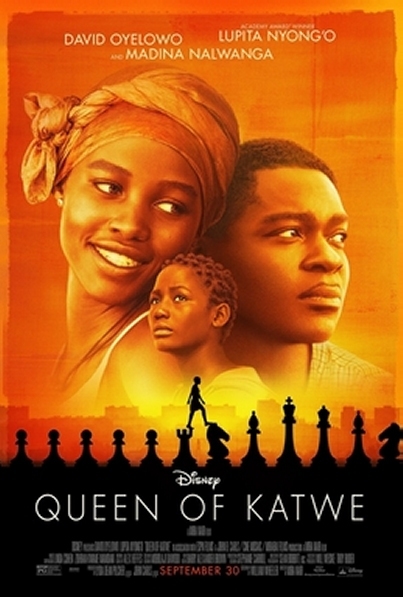 The story of the real Queen of Katwe and the Som Chess Academy can be found here.